Researchers from City of Hope, a world-renowned comprehensive cancer center and independent biomedical research institution, have developed a synthetic DNA molecule that is programmed to jump-start the immune system to eradicate genetically distinct types of prostate cancer. 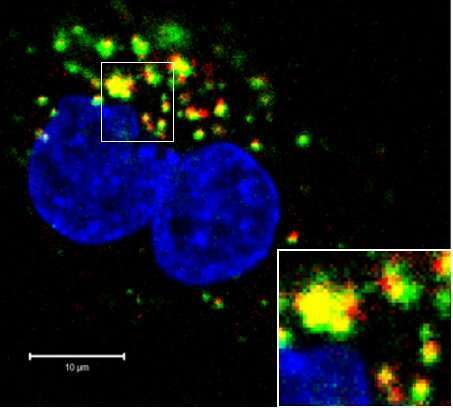 Their novel two-step strategy eliminates STAT3, a master key that enables tumors to become resistant to existing therapies, and toll-like receptor 9 (TLR9), a danger sensor present but not effectively active in immune system cells such as dendritic cells. The short DNA programmed by City of Hope researchers temporarily lifted the defense shield of tumors and awakened the immune system in human cell and mouse models to eradicate difficult-to-treat prostate cancers. "We desperately need new strategies for late-stage prostate cancers, which thus far have resisted emerging immunotherapies," said Marcin Kortylewski, Ph.D., associate professor in the Department of Immuno-Oncology at City of Hope and co-senior author of the study. "It is clear that in this case, we need smart immunotherapies that can outmaneuver wily cancers. Our strategy relies on two opposite actions of the same 'hot and cold' molecule. We fire up the immune system to attack and freeze tumor defenses. The combined effect of such a dual-function drug can remove obstacles to treating the most challenging solid tumors." The preclinical study, published on Oct. 18 in the journal Clinical Cancer Research, created a blueprint of a new type of DNA or "oligonucleotide" drug—CpG-STAT3ASO. It is programmed with two functions to more effectively and safely treat metastatic cancers that are resistant to pharmacological therapies. Notably, using a synthetic molecule with just STAT3 or TLR9 was not as effective in killing prostate cancer as using the two in unison, the study found. "While existing immunotherapy options can improve outcomes for selected prostate cancer patients, it is clear that these patients are in the minority," said Sumanta Kumar Pal, M.D., associate clinical professor in the Department of Medical Oncology & Therapeutics Research at City of Hope and co-senior author of the study. "It is our hope that the agents developed in the Kortylewski lab will yield benefit in a greater proportion of patients with advanced disease." It is too early to know, Kortylewski said, but it's possible that this DNA molecule could be used in the future for therapeutic vaccination against metastatic prostate cancer. Such an agnostic and off-the-shelf approach could work regardless of the genetics of an individual's prostate cancer. But more preclinical research on the pharmacologic properties of these new drugs is needed to get there, he said.